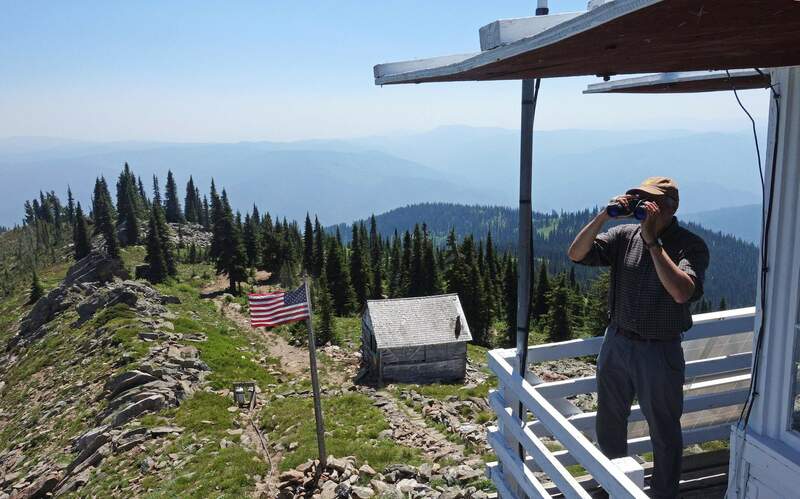 Tom VandeWater stands at the railing of the Coolwater Fire Lookout and looks through his binoculars in the Nez Perce-Clearwater National Forests near Lowell, Idaho. VandeWater, from Canton, N.Y., has staffed the lookout each summer for many years for the U.S. Forest Service. 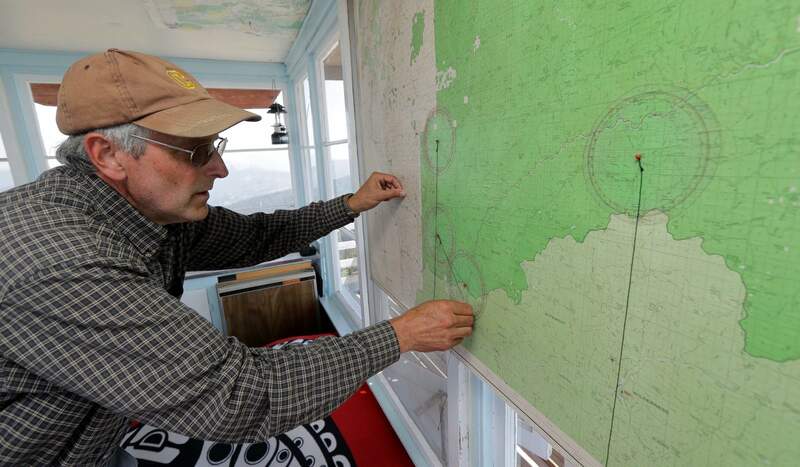 Tom VandeWater demonstrates how he uses a device called the Osborne Fire-Finder to pinpoint the location of any smoke or fires he spots from the Coolwater Fire Lookout in the Nez Perce-Clearwater National Forests near Lowell, Idaho. 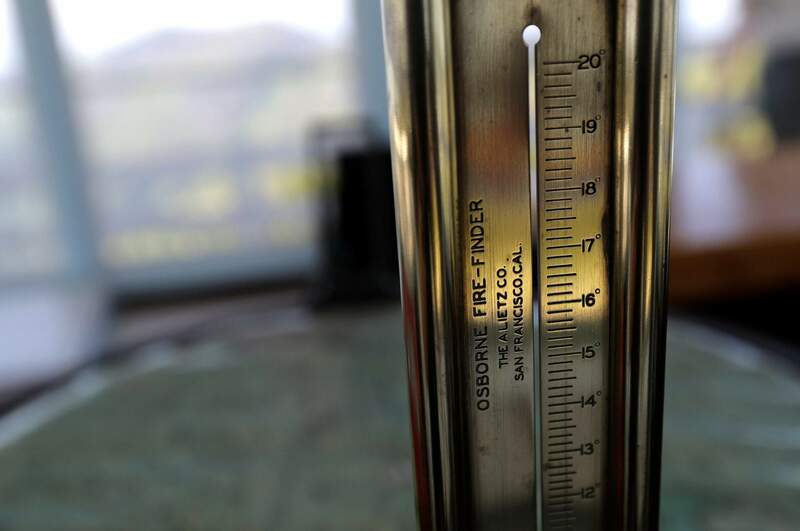 The rear sight of a device called the Osborne Fire-Finder that is used to pinpoint the location of smoke or fires spotted from the Coolwater Fire Lookout, is shown at the lookout in the Nez Perce-Clearwater National Forests near Lowell, Idaho. 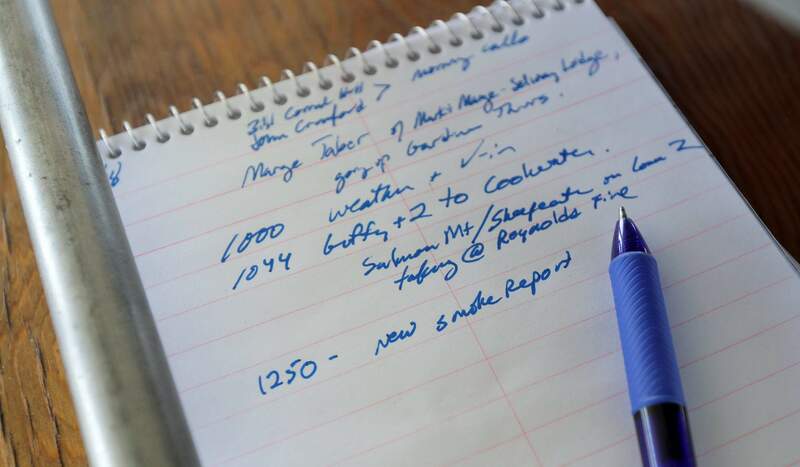 Notes made by U.S. Forest Service fire lookout Tom VandeWater are shown on a pad at the Coolwater Fire Lookout in the Nez Perce-Clearwater National Forests near Lowell, Idaho. 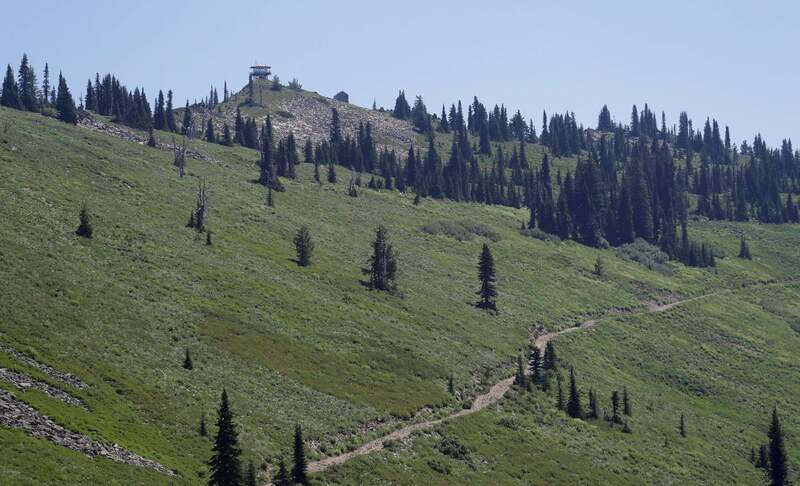 Fire-lookout towers, perched atop remote, craggy peaks across the U.S. West, may seem like quaint reminders of an era before satellites, smartphones and jet-propelled air tankers, but the structures and the people who staff them play a crucial role in the nation’s front-line efforts to stop wildfires. The Coolwater Fire Lookout, upper left, sits high on a peak in the Nez Perce-Clearwater National Forests near Lowell, Idaho. The lookout has been staffed each summer for more than 100 years. Other towers across the U.S. West may seem like quaint reminders of an era before satellites, smartphones and jet-propelled air tankers, but the structures and the people who staff them play a crucial role in the nation’s front-line efforts to stop wildfires. 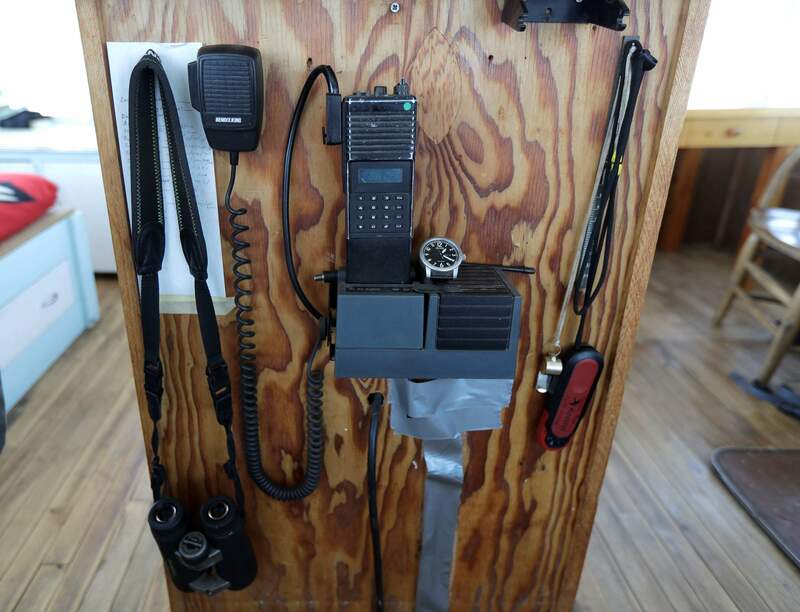 A radio, binoculars, and other tools used by Tom VandeWater, who staffs the Coolwater Fire Lookout each summer for the U.S. Forest Service, are displayed in the Nez Perce-Clearwater National Forests near Lowell, Idaho. 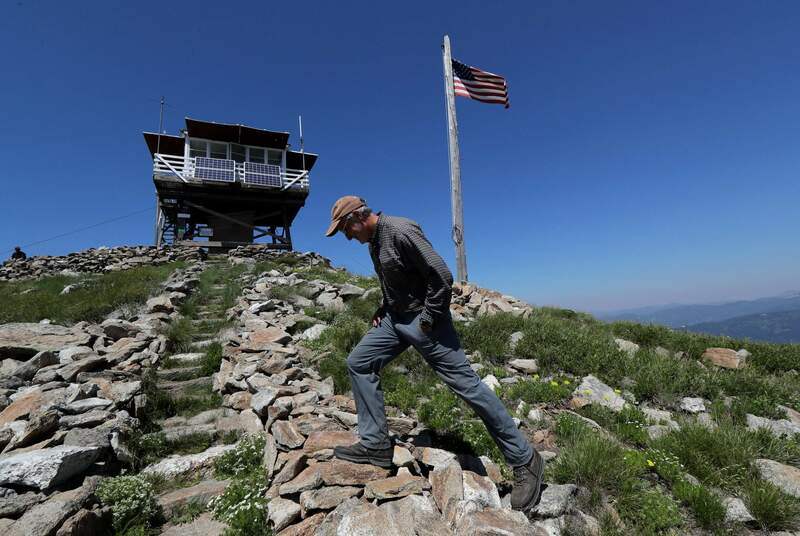 Fire-lookout towers, perched atop remote, craggy peaks across the U.S. West, may seem like quaint reminders of an era before satellites, smartphones and jet-propelled air tankers, but the structures and the people who staff them play a crucial role in the nation’s front-line efforts to stop wildfires. 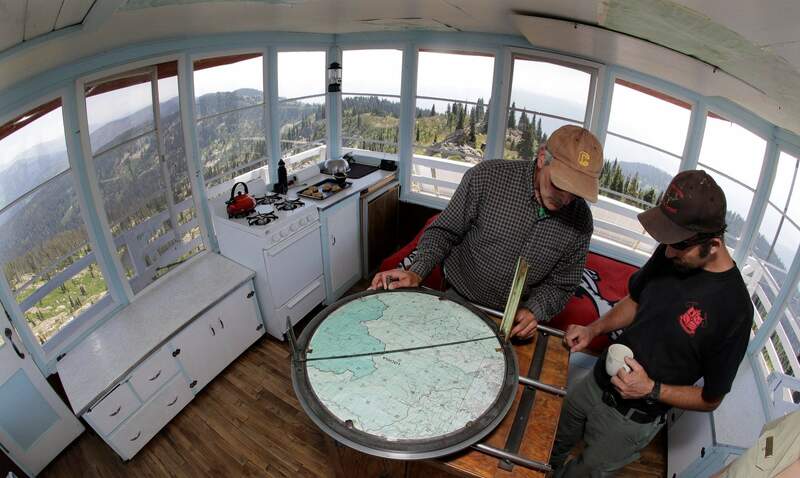 Tom VandeWater, left, explains how he uses a device called the Osborne Fire-Finder to pinpoint the location of any smoke or fires he spots from the Coolwater Fire Lookout to Cory Guffey, a U.S. Forest Service initial attack crew captain, at the Coolwater Fire Lookout in the Nez Perce-Clearwater National Forests near Lowell, Idaho. 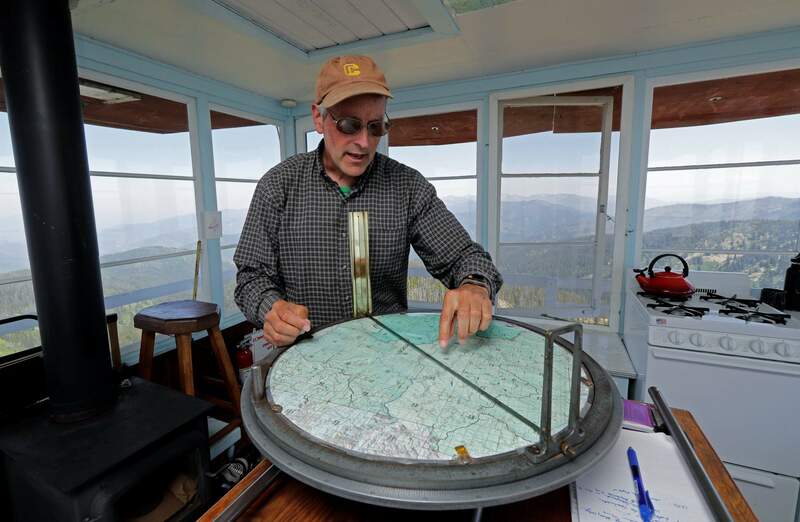 Tom VandeWater, who staffs the Coolwater Fire Lookout in the Nez Perce-Clearwater National Forests for the U.S. Forest Service near Lowell, Idaho, demonstrates how he uses the location and sight-lines of other fire lookouts to help pinpoint the location of any fires or smoke he spots from his lookout station. 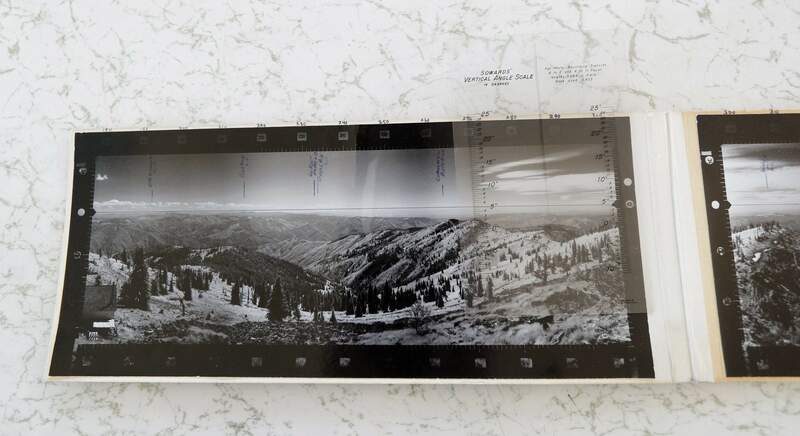 A panoramic photo likely dating from the 1950s is shown at the Coolwater Fire Lookout in the Nez Perce-Clearwater National Forests near Lowell, Idaho. Tom VandeWater, who staffs the station each summer for the U.S. Forest Service, uses the photos, which are precisely marked with directional measurements, to help him identify the names and areas of possible fire locations when he spots fires at night. 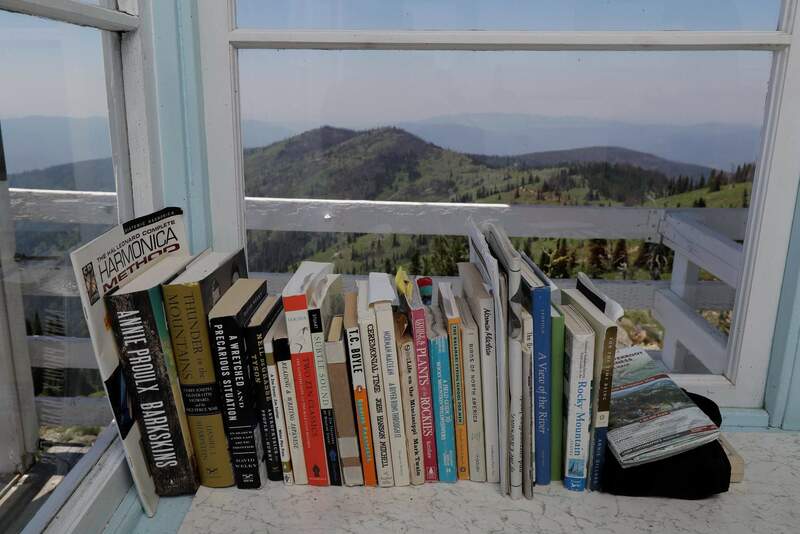 Books and other reading material are shown on a table at the Coolwater Fire Lookout in the Nez Perce-Clearwater National Forests near Lowell, Idaho. 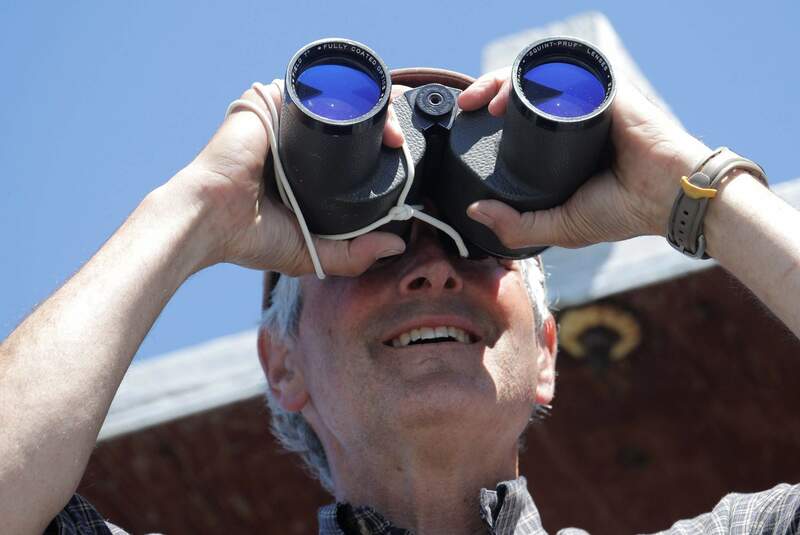 Tom VandeWater, of Canton, N.Y., has staffed the lookout each summer for many years for the U.S. Forest Service. 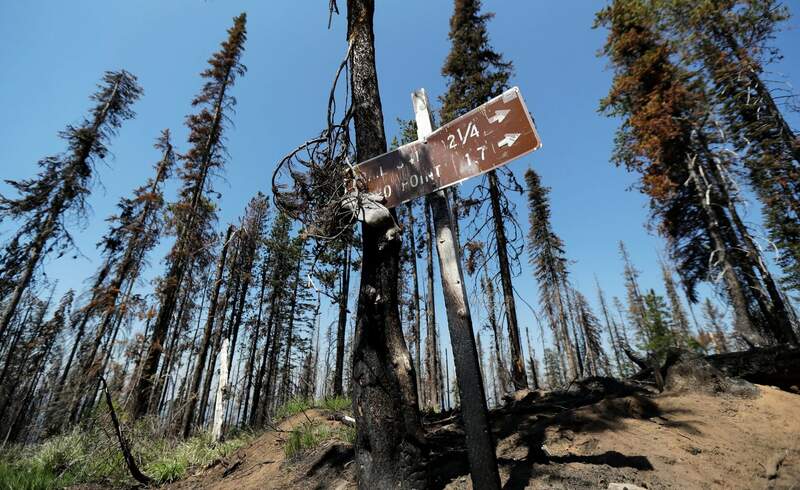 A trail sign and trees that were burned in a 2017 wildfire stand out from the blue sky a few miles from the Coolwater Fire Lookout in the Nez Perce-Clearwater National Forests near Lowell, Idaho. 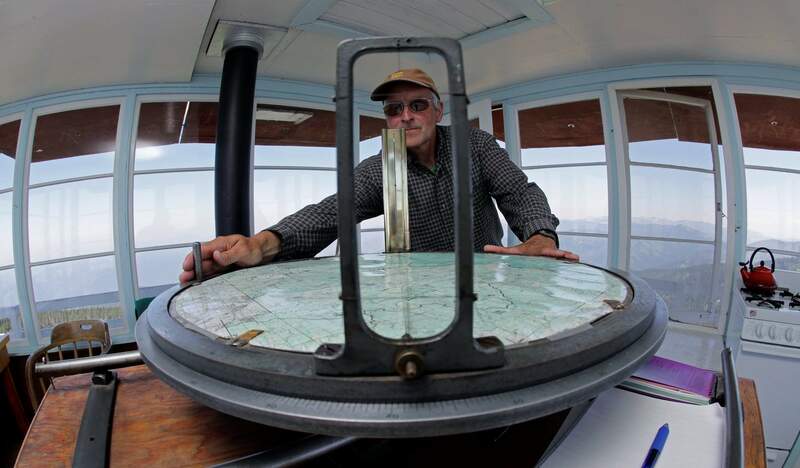 Fire-lookout towers, perched atop remote, craggy peaks across the U.S. West, may seem like quaint reminders of an era before satellites, smartphones and jet-propelled air tankers, but the structures and the people who staff them play a crucial role in the nation’s front-line efforts to stop wildfires. Tom VandeWater walks up the stone steps to the Coolwater Fire Lookout in the Nez Perce-Clearwater National Forests near Lowell, Idaho. VandeWater, from Canton, N.Y., has staffed the lookout each summer for many years for the U.S. Forest Service. Fire-lookout towers, perched atop remote, craggy peaks across the U.S. West, may seem like quaint reminders of an era before satellites, smartphones and jet-propelled air tankers, but the structures and the people who staff them play a crucial role in the nation’s front-line efforts to stop wildfires. Tom VandeWater stands at the railing of the Coolwater Fire Lookout and looks through his binoculars in the Nez Perce-Clearwater National Forests near Lowell, Idaho. VandeWater, from Canton, N.Y., has staffed the lookout each summer for many years for the U.S. Forest Service. Fire-lookout towers, perched atop remote, craggy peaks across the U.S. West, may seem like quaint reminders of an era before satellites, smartphones and jet-propelled air tankers, but the structures and the people who staff them play a crucial role in the nation’s front-line efforts to stop wildfires. 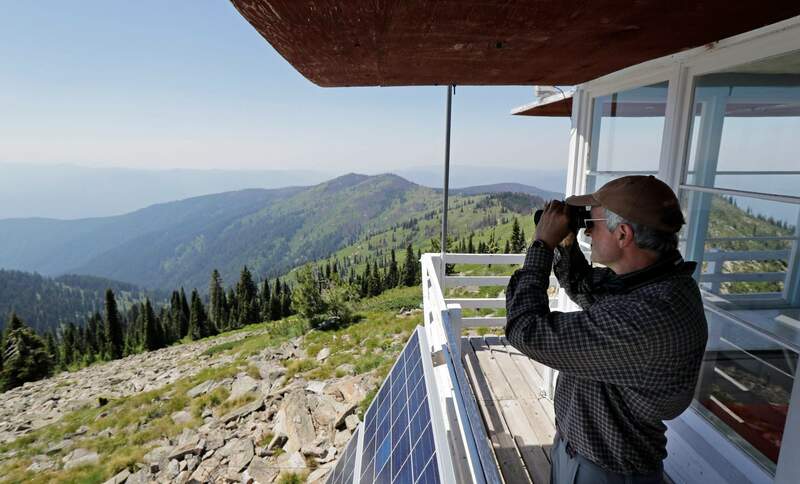 Tom VandeWater stands at the railing of the Coolwater Fire Lookout and looks through his binoculars in the Nez Perce-Clearwater National Forests near Lowell, Idaho. VandeWater, from Canton, N.Y., has staffed the lookout each summer for many years for the U.S. Forest Service. At left is the previous lookout structure, which dates to the 1930s.